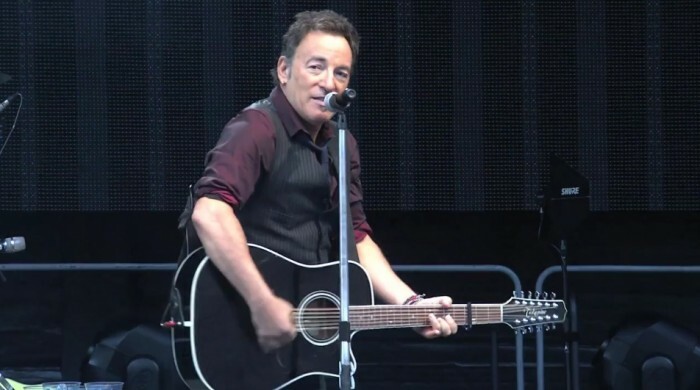 Fourteen days before a landmark presidential election, Bruce Springsteen came to a city steeped in presidential history — Charlottesville, in electoral battleground Virginia — to rally about 3,500 people in support of President Obama’s re-election bid. 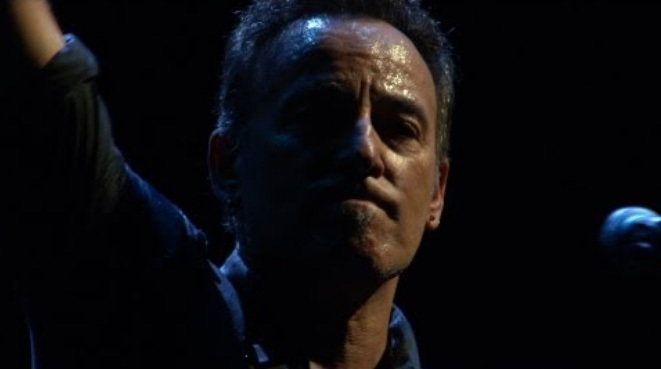 Springsteen’s stirring, six-song performance at an event sponsored by Obama for America took place the day after the third and final presidential debate, a progression that could be called “Big Bird... Binders… Battleship and bayonets… Bruce.” It marked a first-of-its-kind doubleheader for Springsteen: Though he has performed at nearly a dozen campaign rallies for Democratic presidential candidates in 2004, 2008 and so far this year, today marked the first time he has combined a rally and a Bruce Springsteen and the E Street Band tour gig on the same day. He and the band play tonight at sold-out John Paul Jones Arena (named after the Revolutionary War hero, not the Led Zeppelin bassist). Charlottesville, in the foothills of the Blue Ridge Mountains in western central Virginia, is home to the University of Virginia. Two presidents – Thomas Jefferson, whose Monticello plantation is four miles from the downtown nTelos Wireless Pavilion where the rally was held, and James Monroe — hailed from Charlottesville. The Charlottesville rally was Springsteen’s third recent Obama campaign event, following October 18 rallies in Parma, Ohio and Ames, Iowa. Those occurred during a month-long break in the Wrecking Ball tour. Tonight is Springsteen’s first U.S. show since MetLife Stadium in East Rutherford, NJ. In contrast to the downpour that famously delayed that show, today’s calendar-defying Southern Chamber of Commerce weather put the girls in their summer clothes and the trees in their finest fall colors. Springsteen walked onstage at 3:18 pm and, after embracing Kaine, said, “I heard there was a good band playing near here tonight.” Then he launched into “No Surrender,” which built to a crescendo with Bruce strumming hard on his honey-burst-colored acoustic. Springsteen then spoke, repeating the themes and much of the language of his speeches at the two previous re-election rallies. Springsteen then delighted the crowd with “The Promised Land.” He raised the drama of one of his most popular tunes by singing the final chorus a bit off mic. The set concluded with three stunners: “The River”; “We Take Care of Our Own,” which included an appropriately reflective-sounding audience sing-along on the chorus; and “Thunder Road,” which Springsteen dedicate to Senate candidate Kaine. “It’s a town full of losers / we’re pulling out of here to win.” It sounded like not only one of the greatest song endings in rock, but an urgent wish. On July 7th, Bruce and the Band played for nearly 100,000 people at the classic Roskilde Festival, forty minutes outside of Copenhagen. 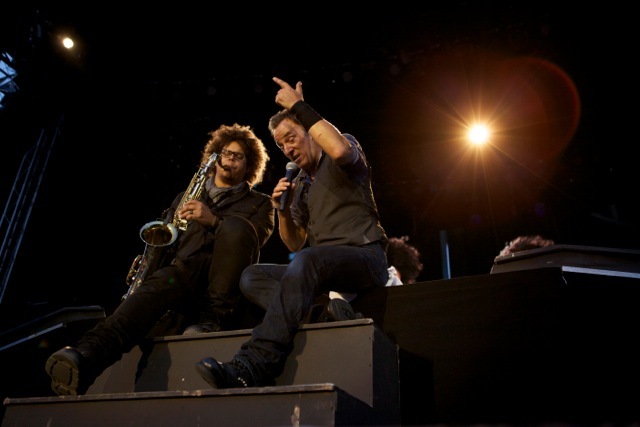 Bruce and E Street took the stage following a stellar performance by The Roots. 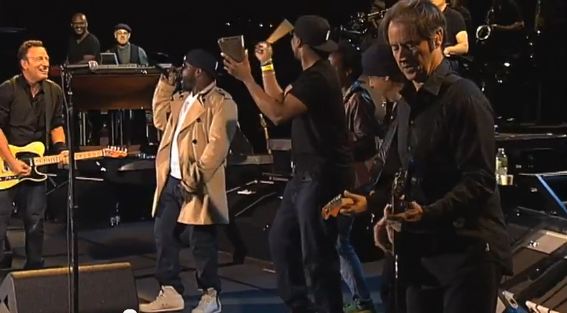 Naturally, when Bruce was ready to do "E Street Shuffle," he called his friends of The Legendary Roots Crew back up on stage to reprise their joint performance of the song from Late Night With Jimmy Fallon this past March. The scintillating performance was captured in this Chris Hilson line cut with John Cooper's board mix. Participating in the performance from The Roots are Black Thought, Kamal Gray, F. Knuckles, Captain Kirk Douglas, Damon "Tuba Gooding Jr." Bryson, James Poyser, and Mark Kelley.